We only have one more episode left to go, in this particular season. In the next episode, we’ll discuss Chapter 18: Dobby’s Reward and Harry Potter and the Chamber of Secrets as a whole. If you have a theory to share or want us to discuss something specifically, let us know! This mammoth episode was recorded in one go. We knew there was a lot to discuss but we were kind of surprised ourselves. If you’re surprised too, please respond with a gif. Some smart people on the Internet wondered how the entrance to the ancient Chamber of Secrets that predates modern plumbing could be put in a girls bathroom. Pottermore has a fix! It was moved in the 1600s to the girls bathroom by Cornivus Gaunt. Incompetent Tom Riddle always gives Aishwarya the giggles. After Hermione is petrified, Ron is in shock. There are talks about the school closing. This drives Harry to confront Hagrid. When Ron and Harry visit Hagrid, they observe that he is oddly jittery. They don’t have to wait long to find out why. Hagrid is visited by Cornelius Fudge and Albus Dumbledore. Fudge, the minister of Magic wants to send Hagrid to Azkaban, the wizard prison, because they have to be seen “doing something” to prevent the attacks. Lucius Malfoy also arrives and tells Dumbledore that he is suspended. 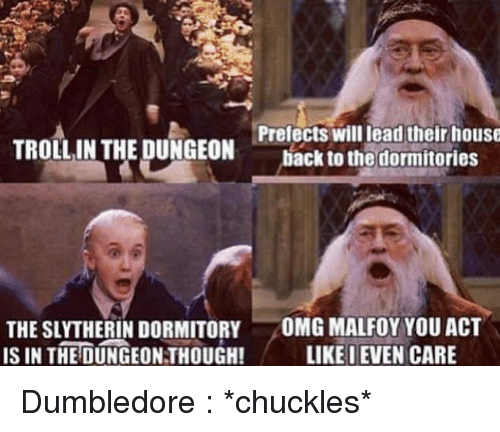 Malfoy thinks that Dumbledore was not a good headmaster that year and we kinda agree. Dumbledore and Hagrid leave the hut but not before delivering cryptic messages to Harry and Ron who were hiding there the whole time. Of those, “follow the spiders”, the message Hagrid gives them is the one relevant to this episode. Ron displays immense courage and loyalty when he decides to follow the spiders in spite of being mortally afraid of them. The spiders lead them deep into the forbidden forest where they are abducted by elephant-sized spiders. They take them to meet Aragog who clears Hagrid’s name from the whole chamber of secrets ordeal. Aragog mentions that Hagrid gave him life and a family and promptly orders the said family to kill and feed on Hagrid’s friends… and you thought Ron’s fear was irrational. Tut tut. How they escape the most horrifying kind of death forms the rest of the episode. (and Harry) discovers a suspicious diary in Moaning Myrtle’s bathroom. He’s very skeptical of it because books can be dangerous (beyond just giving you dangerous ideas) but Harry picks it up and carries it around anyway. suspects that Hermione might have given Lockhart a valentine. He is also around when Harry is forced to listen to his humiliating valentine. is not present when Harry writes his name on a page in T.M Riddle’s diary and discovers that the diary can write back. The diary belongs to someone who caught the person who previously opened the Chamber and you’ll never believe what happens next. DUN DUN DUNNNN. 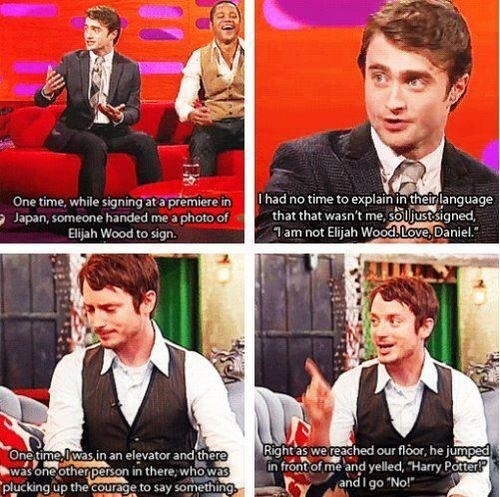 thinks that Riddle sounds shifty because he turned Hagrid in. He also picks classes sensibly instead of making choices based on someone else’s choices (AHEM). is sympathetic when the diary is stolen and also concludes that it’s a probably a Gryffindor who stole is. When we last left off, Harry was beginning to question if he could really be the heir - he can speak Parseltongue AND the Sorting Hat wanted to place him in Slytherin. But before investigating anything else, Harry decides to find Justin Finch Fletchley and explain what happened the previous night. When attempting to find Justin, Harry overhears a bunch of Hufflepuffs discussing the possibility of his being the heir and attacking Muggleborn students. Angry, Harry decides to return back to Gryffindor Tower - on his way back, he stumbles across a petrified Justin Finch Fletchley, just the person he was looking for, and the blackened shade of Nearly Headless Nick. When Peeves alerts everyone to the proceedings, McGonagall clears the corridor and escorts Harry to Dumbledore’s office. While waiting for Dumbledore, Harry pokes around his office and finds the Sorting Hat that tells him that it stands by its decision and he’d have done well in Slytherin. Just as he’s looking around for something to distract him, Dumbledore’s bird catches on fire but Dumbledore assures him that it’s alright because it’s a phoenix. Hagrid rushes into Dumbledore’s office to proclaim Harry’s innocence and Dumbledore reassures him that he doesn’t think that Harry’s responsible. When Dumbledore invites Harry to confide in him, Harry declines. It’s Christmas Day by the time the Polyjuice potion is ready. Hermione makes a plan to knock Crabbe and Goyle out with a Sleeping Draught so that Ron and Harry can assume their identities - her plan is to use the hair she plucked off Millicent Bullstrode’s robes from the Dueling Club. The plan goes off without a hitch and Harry becomes a replica of Goyle, Ron of Crabbe. Hermione refuses to come out of her stall, so Harry and Ron set off alone. Unfortunately however, they find out that all the effort is for vain because Malfoy said he doesn’t know who the heir is. They nearly get made but they manage to make it out of the Slytherin Common Room before their identities are revealed. Hermione however is still in her stall because the hair she added to her potion turned out to belong to a cat. Aishwarya loves this scene because it’s her favorite Dumbledore plus look how cute baby Fawkes is!! Prashanthini would like to note that Lucius Malfoy is a consummate politician who tries to use everything to make sure his wishes are met. Mr. Weasley has a flying car? Surely, he must be sacked and ALL the policies he enforced should be removed. Aishwarya concurs and would like to add that Lucius probably sent Draco the clipping so he could use it against Ron. The episode is pretty short and it’s not just because we didn’t have as much to discuss as we usually do but also because there was some kind of electrical work going on in the building we work in. So, if you hear some distant shouts and thuds that the editor (Aishwarya) missed, apologies. It’s also the reason we practically hurry through the Slytherin common room bits. "Training for the Ballet, Potter?" Welcome to yet another electrifying, riveting, innnnnvigorating episode of Mimblewimble - the Harry Potter podcast! Okay, that's enough excitement for today. After Ron learns about the Chamber of Secrets, he thinks it's just like Salazar Slytherin to do something this twisted. He is also disgusted to find out that the whole school somehow came to the conclusion that it is Harry who is behind all the attacks. Harry, Ron and Hermione go back to the scene of crime to investigate. There, they find many spiders leaving the castle. Ron reveals that he has a fear of spiders much to Hermione's amusement. They go to the out-of-order girl's bathroom and talk to Moaning Myrtle about the night of the attack. The trio strongly suspects Malfoy, and Hermione comes up with an idea to make him confess to them - the Polyjuice potion. The fact that Hermione is leading the charge to break about 50 school rules shocks Harry and Ron. During the first match of the season, Harry is followed around by a rogue bludger. He catches the snitch and wins the game against the Slytherins with their superior brooms, but still ends up in the Hospital wing, thanks to the bludger and Lockhart. Dobby visits him and reveals that the Chamber had been opened before but this time around, it is particularly dangerous for Harry even though he is a half-blood. Their conversation is cut short by Dumbledore and McGonagall bringing in the petrified body of Colin Creevey, poor guy. Lockhart starts a dueling club where Harry is paired with Malfoy for a duel. Things turn nasty quickly and Malfoy (with the help of Snape), ends up setting a snake on Harry. You will never believe what happens next. In this episode, this segment features Vinoth Shankaran, a friend and listener of the podcast. - Harry and Ron get assigned detentions. McGonagall smartly tailors the detentions - Harry gets assigned time with his favoritest Defense Against the Dark Arts Professor and Ron has to clean the trophy room, in the Muggle way, with Filch. Talk about fun. During his detention, Harry hears a disembodied voice but can't be sure where it was coming from or who it could be. - Harry almost gets another detention from Filch for dripping mud in the corridor but is saved by Nearly Headless Nick. Nick also invites him to his 500th Deathday Party on Halloween; Harry agrees to attend, with Hermione and Ron, out of sheer gratitude. - As per Ron's prediction, the Deathday party turns out to be dead depressing so they split midway to go back to the feast. Harry hears the disembodied voice again in the corridor (Ron and Hermione can't), except this time it's saying a lot of scary stuff like 'Rip. Tear. Kill.' and 'I smell blood'. Harry runs towards the voice, a confused Ron and Hermione in tow, and end up in front of some writing on a wall ('The Chamber of Secrets is open. Enemies of the heir, beware') and a petrified cat - Mrs. Norris. The entire school shows up just after they do and catches them at the scene of the crime. - Filch accuses Harry of killing his cat because Harry figured out he's a Squib. But thankfully, Dumbledore believes that Harry had nothing to do with the incident and gets him off the hook. Hermione remembers reading about the Chamber of Secrets but she doesn't have her copy of Hogwarts, A History to refresh her memory and all the copies have been borrowed from the library. So, she interrupts Professor Binns during a History of Magic lecture and asks him. That's how Ron learns about the Chamber of Secrets. In this episode, this segment features Pavithra Muthalagan, a friend and listener of the podcast. The wikipedia entry for a Kelpie. Looks like they figure in the newest Fantastic Beasts and Where to Find Them: The Crimes of Grindelwald movie. "It'll be gone by Tuesday"
In this episode, we discuss Harry playing his second Quidditch match, meeting his first dragon and getting his first detention at Hogwarts. Still recovering from his encounter with the Mirror of Erised, Harry throws himself into his Quidditch training to get his mind off things. Neville thwarts them in their quest to read every book in the Hogwarts Library, in their quest to find out who Nicolas Flamel is, by giving them a Chocolate Frog card that reveals his identity. He turns out to be 665-ish odd years old and the only known maker/possessor of the Philosopher's Stone, something that can produce the Elixir of Life. Just before his second ever Quidditch match, Harry discovers that Snape is going to be the referee. Mentally prepared for things to go south, Harry is pleasantly surprised when the match goes off without a hitch and Gryffindor wins. After the match, even as he revels in the excitement, Harry overhears a conversation between Snape and Quirrell that confirms their suspicions about the Philosopher's Stone. He also discovers that there are a series of defenses set by the Hogwarts teachers to protect the Stone, and thinks that Snape wants to figure out how to get around them. In the meantime, Hagrid wins a dragon's egg in a game of card and successfully hatches it. His attempts to raise a fire-breathing dragon in a wooden house predictably fail and the trio manage to convince him that Norbert, the dragon, is better off with Charlie, Ron's brother, in Romania. However, Malfoy discovers the existence of Norbert and attempts to thwart their handoff, getting detention in the process. This event ends up making Harry and Hermione so excited that they walk straight into Filch, and detention, themselves. We also have our second Harry Potter story shared by a listener and a friend of the podcast - Niranjan Murali (thanks, Ninja!). Chapter 15: The Forbidden Forest - first 2 pages. If you want to read books with the swamp dragons in them, I'd recommend the City Watch series by Terry Pratchett because it features the fantastic Lady Sybill Vimes (née Ramkin) who breeds and cares for swamp dragons. Us when we realized we made another sports-related booboo. We solemnly swear not to do it ever again. "We're not stupid. We know we are called Gred and Forge." In the sixth episode, we discuss everything that happens between Harry getting a new friend and Harry meeting Dumbledore. After the Harry Potter trio, as we know now, is formed, we can see them helping each other out as any trio should. Hermione helps by lending Harry a copy of "Quidditch through the ages" and Ron helps Harry by saying mean things about Snape behind his back. Harry's first Quidditch match is against Slytherin. If Gryffindor wins, they might win the House cup. If they don't Slytherin might win for the eighth time in a row. With so much riding on the outcome, Harry is understandably nervous. During the match, Harry loses control of his broomstick. Hermione realizes that Snape is messing with Harry's broom, thinks quickly on her feet, distracts Snape and saves Harry. He goes on to catch the snitch and win the match for Gryffindor. When they discuss Snape's broom tampering with Hagrid, he lets slip that someone called Nicolas Flamel is involved with whatever the three-headed-dog is guarding. After that, the trio makes it their mission to find out who Nicolas Flamel is. Christmas comes. Harry receives a mysterious birthday present which Ron rightly identifies as an invisibility cloak. Harry uses it to go to the restricted section of the school library and find out about Nicolas Flamel. But he almost gets caught by Filch and Snape. He enters a disused classroom and finds the Mirror of Erised. He is consumed by what he sees in the mirror and keeps coming back until Dumbledore intervenes and tells him that the mirror was going to be moved and that he should not go looking for it. We also have our first Harry Potter story shared by a listener and a friend of the podcast - Manasvini Ravi. You can also listen to this podcast on iTunes and your other favorite podcast app. Just search for Mimblewimble - The Harry Potter Podcast. In the fifth episode, we discuss the events of Harry Potter and the Philosopher's stone that happen between Harry becoming a seeker and Harry getting a new friend. Lots of exciting stuff happens between these two events. Malfoy challenges Harry to a midnight duel that is obviously a trap to get him into trouble. Hermione, while trying to stop them from going, ends up with them in the trophy room. All three of them run into the three-headed dog in the forbidden corridor but somehow come back to the dorm in one piece. Harry gets a kickass new broom and starts practicing for Quidditch. Ron upsets Hermione who skips the Halloween feast to stay in the bathroom and cry. A troll is set loose in Hogwarts. Ron and Harry hurry to save Hermione. The three come out of the troll encounter alive with their differences forgotten, with friendship blossoming. JK Rowling's sense of humor is at its finest in these chapters. We are starting a new segment called Harry Potter stories. Every Harry Potter fan has a story about when and how they started reading the series and what it means to them. We wanna hear it! In this episode, we share our own Harry Potter stories. From the next episode, we will be playing the stories sent in by our listeners. We can't wait to hear your stories! We will start sharing listener stories from the next episode. Oops! We refer to baseball when we're talking about the Superbowl when we should have been talking about football. There's a good reason we aren't getting paid to do this full time. The original forty - An entry on Pottermore where JK Rowling shares the names of the original forty students who were supposed to study with Harry.